Akira Kurosawa’s masterpiece Seven Samurai is over sixty years old. Film prints have become worse for the wear, which is why movie studio Toho is going back and restoring the picture in 4K, making it more beautiful than ever. NHK and AV Watch report that Toho converted the film’s nearly 30,000 frames into digital data and then painstakingly gone back through frame by frame to restore the image quality and convert the movie to 4K. The goal is to get the restored version as close as possible to a pristine version of the original film print, removing as many scratches and grime as possible by replacing parts of damaged frames with sections from clean ones. Original film prints are being used for the restoration and not the original negative. The reason, AV Watch explains, is that Toho doesn’t know where the negative is. The shooting film was highly combustible, so it’s possible the negative might have even been discarded. The image on the left is prior to restoration. The image on the right is post restoration. The film prints, however, had deteriorated to the point where certain scenes turned white-ish. 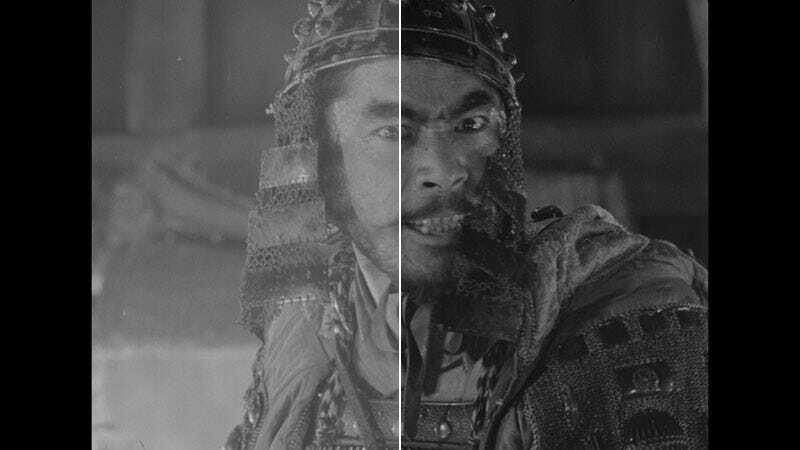 Thanks to the restoration, they are now back to the rich black and white that Kurosawa originally intended. The film’s sound and voice tracks are also being cleaned up. Notice how faded the film print has become. Teruyo Nogami, who worked with Kurosawa as his script supervisor, is overseeing the restoration and thinks if the deceased filmmaker could see the restoration, he would be delighted. The image on the left has not been restored. The image on the right has. The restored Seven Samurai will open at Japanese theaters across the country this October. Kurosawa’s classic Ikiru is also getting a 4K restoration.